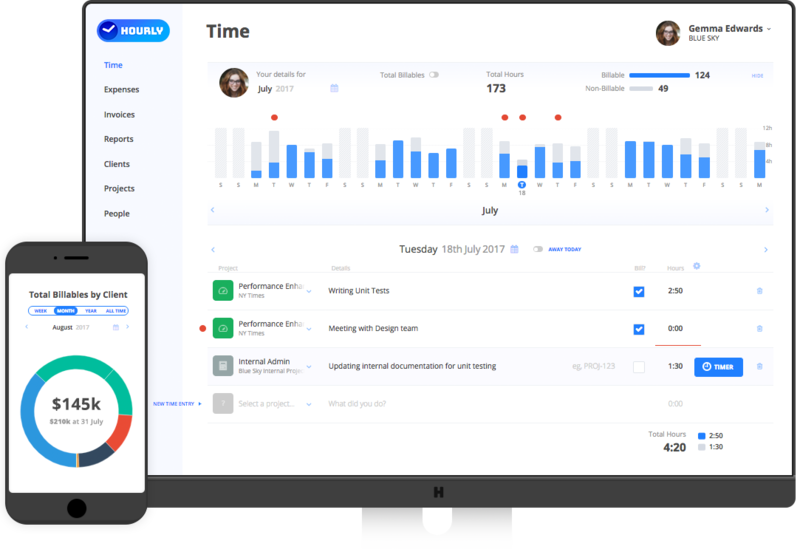 Hourly is a time tracking and analytics platform with a range of intelligent features - like predictions that learn and improve over time - to help take your services business to the next level. Hourly takes incoming time data and processes the information, looking for important events and identifying patterns so that it can produce a range of useful outputs to help you stay on top of things and make better decisions. A great time tracking experience for you and your team - every day. The things we use every day should make us happy. That’s why our mission at Hourly is to make the daily task of time tracking more motivating, insightful and actionable and less like an online spreadsheet. Hourly helps users keep on top of their timesheets by flagging incomplete entries and highlighting working days without any activity. They also receive friendly reminders with direct links to quickly and easily fill in any blanks. Hourly provides forward estimates based on historical trends, patterns and future known events such as public holidays and annual leave. These estimates complement any existing project planning and sales forecasting to provide a baseline for comparison. Predictions available across people, projects and clients. Predictions available for week, month and year. 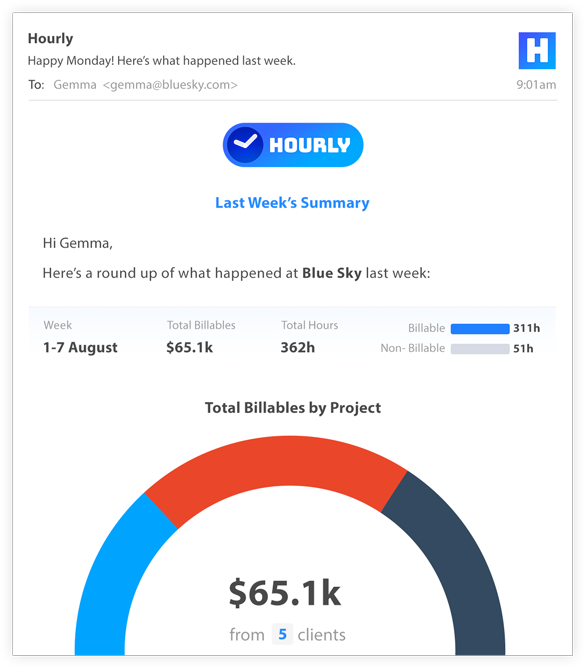 Hourly’s real-time reports and weekly email summaries help you stay up to speed with everything billing and productivity related. Hourly helps users keep on top of their timesheets by flagging incomplete entries and highlighting working days without any activity. It also receive friendly reminders with direct links to quickly and easily fill in any blanks. 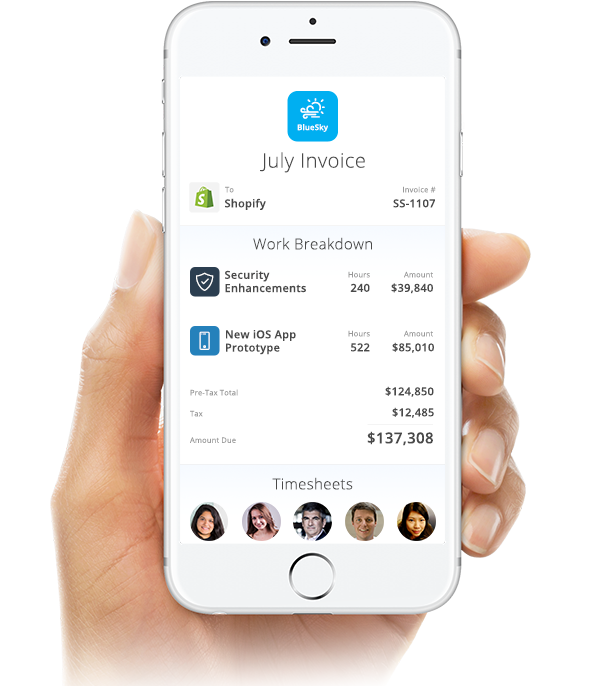 Hourly’s beautiful and detailed web invoices go beyond what your accounting system can provide. 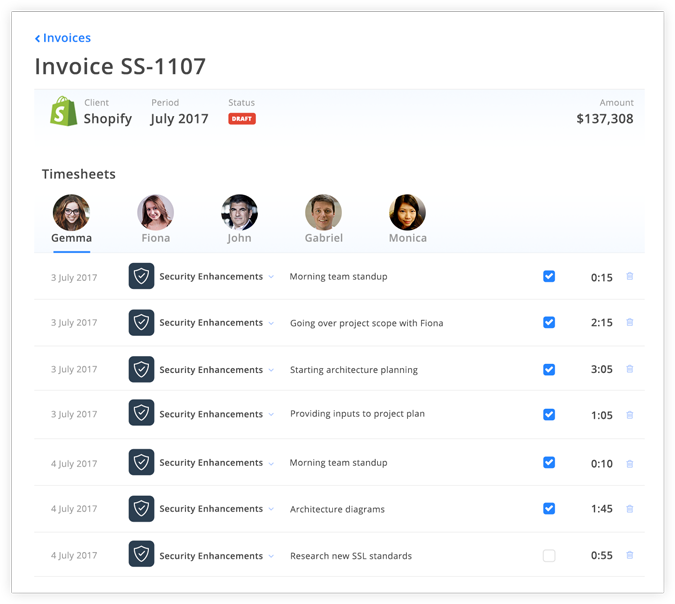 With project breakdowns and the option to attach timesheets, Hourly’s web invoices will help you deliver a professional customer experience, build trust with clients and save time generating project updates.